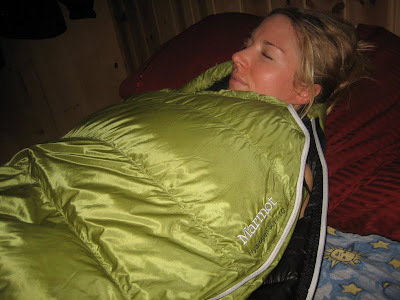 I was looking for an ultra-light weight 3 season sleeping bag. The primary uses would be for ski hut trips in the Colorado backcountry and summer camping. Over the years, I’ve managed to get fairly efficient at packing and I rarely carry more than a 55L pack, even for several nights out. 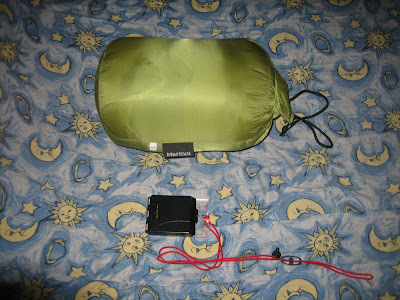 So the sleeping bag needed to be highly compressible as well. My final requirement was a full length zipper. I’ve tried bags with only a half zipper and they just didn’t work for me – I like to be able to stick my feet outside the bag when it’s warmer and the half-zips were something of a pain to get in and out of. Enter the Marmot Hydrogen. Utilizing 850+ goose down, it weighs in at 1 lb 8 oz, is rated at 30 °F, has a full length zipper, and stuffs down to about 6”x12”. I’ve taken it on several hut trips and been thoroughly pleased. As you may know, the huts are heated with wood burning stoves, so the indoor temperature can be all over the board. Thanks to the small size of the hut and my zealous partners, the temps at bedtime were close to 60 °F and I appreciated the full zipper. But by morning things had cooled down significantly and I was burrowed comfortably into the bag with the zipper up. I haven’t pushed the comfort zone on the temperature rating (yet), but with the full mummy design and drawstring hood, this will be my go-to bag for all but the worst of conditions. Here are the specs from Marmot. Want to improve your backcountry skiing skills and gain confidence in decision making in the mountains so that you can enjoy one of the many backcountry huts or yurts in Colorado? Join CMS for a L1 Avalanche Course or a day of guided backcountry skiing this season. I think that something so important in the Mountaineering is the place where yo will sleep, I think that bags sleep are so cool! !